2016 Sun vs. Snow Details!!! It’s that time again for THE BIG BATTLE between the heat and the cold! Yes, it’s time for the third year of Sun vs. Snow hosted by me and the amazing, Michelle Hauck. This time we have a fun new question and some important details about the entry process. Please read the following THOROUGHLY and then let us know if you have questions. 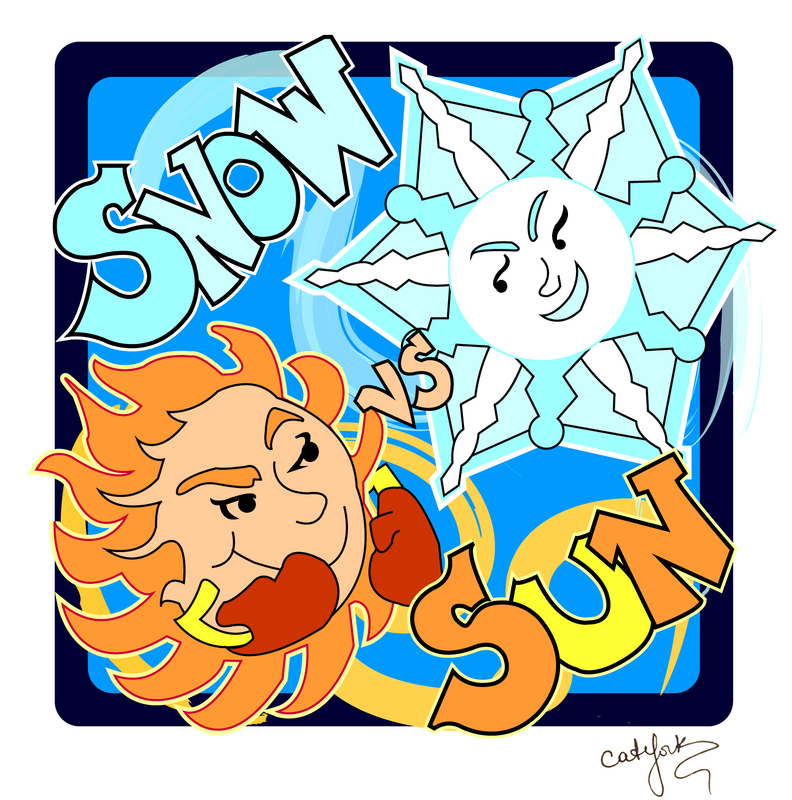 The submission window for Sun versus Snow will open February 1st at 4 pm Eastern time. Act fast. We will only be taking the first 200 entries. Please do not enter early or your entry will be deleted. You can resend at the proper time if this happens accidentally. Confirmation emails will be sent. If you don’t receive one, don’t resend. We don’t want duplicate entries. Please check with us on Twitter first to confirm your entry did or did not arrive, then you may resend. There is only ONE, yes that’s right, ONE entry per person allowed. Any attempt to cheat will result in entries being thrown out. This contest is only for finished and polished stories. Important note: The story can’t have been in the agent round of any other contest. Also, Michelle and I have decided not to accept picture books for this contest. Though we love picture books, contests just don’t seem to be the best place to get them requests. We do accept all MG, YA, NA and Adult genres, excluding erotica. To enter you must be followers of our blogs. Click the “follow this blog” button on my blog. You can find Michelle’s blog here. That’s it for now. Get those entries ready for February 1st and leave any questions in the comments or ask on Twitter. Mentors and agents will be posted in January. As of now we have fifteen fabulous agents, and I have some crazy cool mentors who are itching to work with the selected entries! Keep checking Michelle’s blog too because she may be posting BIG NEWS about a FREE PASS to be on Team Snow! Thanks so much for organizing this contest! If there is additional information about your genre, is it okay to list it with the category and genre (like “YA Fantasy with Vietnamese-inspired elements”) or do you prefer that detail to appear only in the query portion? Thank you for organizing SVS! To follow your blog, do I enter my email where it says “Follow Blog via Email”? And when do we get to see the participating agents? Alright, now to prepare my entry.,. Help! I’m trying to enter SVS for the Snow Free Pass 2016 and every time I click in the box to enter a comment, it is asking for me to select profile (comment as). Do I enter my name here? It doesn’t work. I want to enter with email account. It recognizes me and tells me to comment but I don’t know if I am clicking in the right place. Does the website have browser compatibility issues? What browser should I use? Thank you. Does the no erotica mean no romance as well? My MS definitely has a medium-high level of heat but it’s romance, not erotica. Romance is fine. We’re just not looking for anything that would have themes and content that would equate to what publishing considers Erotica. Will you be accepting Early Readers for this contest? No, sorry. This time no PBs or early readers. I have a quick question. in format is single spaced ok or do you prefer double. Also when will the winners be announced and how many will there be? OOps that more than one! Single space is fine. A post will be coming prior to Feb.1 that will give more details about when we will post the selected entries. Michelle and I will both have 15 entries on our individual teams. I’m not sure what I’d classify mine as for the genre. It contains elements of sci-fi (dimension-hopping, time travel) and fantasy (mind merging/melding with another energy and having the power to control nature). I’ve read the speculative genre is an umbrella genre that allows for a combination of different genres, like sci-fi and fantasy. Would it be better to list it as YA speculative, or to choose on specific genre? I just don’t want to mis-represent the story as being one thing and not meet expectations for that genre. It’s okay to send as YA Spec and Michelle and I can reason it out if your entry is one we would like to select. Just from the basics you’ve provided this sounds like Women’s Fiction. Thanks putting on this contest! I hope this question isn’t silly, but when you say the story can’t have been in the agent round of any other contest, are you including being a finalist in any writing contests (such as an RWA chapter-hosted contest) where the final round judges were agents? No silly questions here! 🙂 My response is check who the agents were in the contest. If they are not participating in this contest, then I say go ahead and submit. What we are trying to prevent is contest overlap.